I am a disgrace to the ‘sisterhood’. I cannot change a fuse let alone a plug. I have never changed a tyre. I have never hung wallpaper. I vaguely recollect painting a skirting board many years ago long before my hips failed and I got too fat and arthritic to reach the floor voluntarily rather than by default, as in tripping or falling over drunk. I have wistfully aspired to mending anything that breaks in our house insecure in the knowledge that it will almost certainly remain broken. I can’t fix dripping taps or jiggle a ballcock. That in my book is very definitely a ‘man job’ and I don’t fill the poison trays when the mice visit either. I most certainly do not do insect nest removal, nor do I climb more than three rungs up a ladder. But then neither do the men in our house, so I make that deuce. The TV remote control is a mystery that I will never solve along with how to reset the cooker clock after a power cut and laying the fire. I am in every department of our domestic non-bliss the antithesis of female empowerment. Thank heavens then for the small army of sparkies, plumbers, chippies, gardeners and their like in and around Oswestry and the Ceiriog Valley. My household has contributed magnificently to the local handyman economy. Largely one man bands, few of these trades people have even the most basic web presence or reputation management nous. So how do you differentiate the cowboy from the good guy? I turn to the Best of Oswestry website. I like its third party endorsement business model and the integrity of the Oswestry franchise owner, John Waine. He only accepts good businesses with excellent credentials and you can view their customer testimonials. If you’re a small tradesman type business a listing on this site, along with the excellent range of marketing support tools it offers, affords a well managed web presence that will boost your profile and enquiry rate. At the rate we break stuff in my house… so will I. We have worked closely with John Waine on a number of projects including the Oswestry Food & Drink Festival and Oswestry LitFest. I’m proud to say our organisation passed John’s rigorous suitability test for listing and has been a Best of Oswestry business since its inception. We are celebrating our fourth successive year as one of Oswestry’s best businesses with a FREE prize draw to win one of our popular slamdunkalicious Tequila Slammer Summer Party Kits. All you have to do to be in with a chance of winning one of these beauties is ‘Like’ The Jools Payne Partnership’s Facebook page and post a photo that best (see what we did there?) sums up your UK super sunny summer 2013. Closing date for Likes and pics is Monday 2nd September. 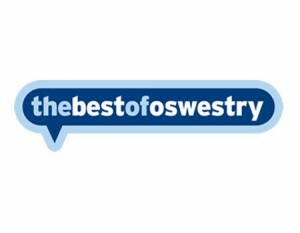 Meanwhile, check us out on www.bestofoswestry.co.uk. You can find us under PR and Marketing.